The spiritual power of music is something with which Mickey Hart is quite familiar. Like Carlos Santana, he's made it an essential part of his life's work. As percussionist for the Grateful Dead, famed author, and a member of the Board of Trustees for the Library of Congress American Folklife Center, Hart has devoted himself to teaching others to fully appreciate just what music can do. Hart has traveled around the world, studying the rhythmic grooves of countless cultures of both the past and the present. He has archived his findings, preserving them for posterity. Not surprisingly, these journeys and discoveries have deeply influenced his own compositions, resulting in some truly timeless, multi-cultural excursions. 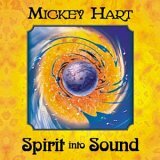 Hart's latest release Spirit into Sound continues down the pathway of spiritual transcendence through the all-mighty groove. Further, his understanding of melody and song has evolved to the point where each track on the album plays out like a meditational hymn. Credit for this is no doubt due to vocalist Rebeca Mauleón who co-wrote eleven of the twelve tracks, but this is a road down which Hart has been traveling for some time. After all, he, Bob Weir, and Robert Hunter transformed the steady throbbing of a water pump into the Grateful Dead's classic Greatest Story Ever Told. More recently, Hart has explored song structure and rhythm on both his Mystery Box and Supralingua albums. Spirit into Sound is simply the next logical step. The concept for the album was developed around Hart's book of the same title. Over the years, Hart has compiled an impressive collection of thoughts and reflections about music by a variety of noteworthy people — from Salman Rushdie to Bob Dylan; from Thoreau to Jim Morrison; from Stravinsky to Duke Ellington; and from Woodrow Wilson to Big Bill Broonzy — and he was driven to transform these ideas into music, converting epiphanies into sound. Unlike Supralingua, Spirit into Sound is a much more subtle affair. It's beguiling grooves gently flow, soothing the soul and carrying the listener towards a state of higher consciousness. There is a circularity to the rhythms that is designed to induce a trance-like state of peaceful meditation. From the three-part commune with nature (Lizard Dance, Nature Talk, and Elephant Walk) to the beautiful and surreal atmospherics of Sueño Tropicale, Hart and Mauleón create lush soundscapes and conjure ancient spirits by matching wordless vocals with world beats and creating colorful palettes of aural ecstasy. Like Hart's previous efforts, Spirit into Sound is a prayer for the earth. It's a connection between this world and the next, between the conscious and the subconscious, and it carries with it a healing of the soul. On the darkest of days and the blackest of nights, it's the guiding light that will alter your perception and lead you home. The Spirit into Sound CD is available from Barnes & Noble. The Spirit into Sound book is available from Barnes & Noble.